Swaziland has a new name - eSwatini - but will anything else change? 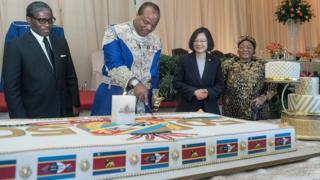 King Mswati III of Swaziland has changed his country's name to eSwatini. The BBC's Nomsa Maseko asks whether the lives of its citizens will change. Crowds waved flags and cheered for King Mswati as he arrived for Independence Day celebrations. The absolute monarch, who rules over one of the poorest countries in Africa, arrived in a top-of-the-range BMW. Still, people were impressed. A member of the crowd waiting to welcome him, Nomusa Dlamini, told me that the king's father wouldn't recognise the country now, after all the new roads and infrastructure. "Our country is peaceful," she added, with her son by her side. The kingdom has indeed not seen a civil war in over five decades, but activists would question whether it could be defined as peaceful. It has a parliament but opposition political parties are banned from its chambers. This is a major concern for pro-democracy activists. The leader of the People's United Democratic Movement, Mario Masuku, has been in and out of prison for years, but never convicted. In 2008 he was arrested on terrorism charges and spent about a year in jail before being acquitted. At the moment he is out on bail, charged with speaking out against the king. "I don't see any difference in me being in a maximum prison and out on bail because while I'm out here, I'm as free as a bird in a cage," he told me. He believes Swaziland has very little to show for its 50 years of independence. "We've been agitating for democratic governance in this country but the king is not prepared to engage in a dialogue with us. "From our point the king is rather too aloof." Why did Swaziland take 50 years to change its name? Some activists want help from neighbouring countries. Swaziland is, after all, tiny and completely landlocked. It is surrounded on three sides by South Africa and to the east by Mozambique. The president of the Ngwane National Liberatory Congress, Alvit Dlamini wants neighbours to put more pressure on the king to change the country's system of government. "I believe that solidarity has helped liberate many countries and I expect our neighbours who are democratic themselves to assist and create a situation that would come towards a dialogue for a free society." He also thinks that while the country has no democracy, it will remain "economically backward". He explains that in 1968 the country was producing over 68% of the staple diet of maize but now they are "living on handouts". That's just the start of his litany of complaints with the country. "Our education system used to be the best in the region but now the standard is low. The health system is has deteriorate to such that people have resorted to travelling to South Africa for better and efficient health care". It's not just South Africa's health care people rely on. Some 90% of the goods going into Swaziland come from South Africa and the Swazi currency, the lilangeni, is tied to the South African rand. To compound this, South African economist Mike Schussler suggests it doesn't look like the kingdom's huge neighbour will be investing any time soon. "eSwatini is just not seen as exciting in growth terms and transparency terms." "If you're a small country you have to be seen to be doing more and better - perhaps like what Botswana has done," said Mr Schussler. He adds that the region is plagued with corruption, which also gets investors worried. It is a country which sorely needs to get out of poverty. Two-thirds of its people live below the poverty line, according to the World Food Programme. Velamuva Msibi, a traditional healer who lives in a village about 40km (25 miles) from the capital, Mbabane, says he doesn't have enough money to pay for school fees to his children and look after his family. The 79-year-old, who has two wives, 19 children and 35 grandchildren, relies on his pension to pay for his whole family. "We have nothing here, life is tough, the pension money is not enough." For now, the name of the country, is the only thing that is changing for Mr Msibi. Letter from Africa: Why did Swaziland take 50 years to change its name?